This soup was just a way for me to use up some vegetables & create a creamy, warming bisque – with tomatoes out of season. Fresh tomatoes would be better but I did not have any & I am attempting to eat only what I have on hand – without spending any money on groceries. I call it “the pantry challenge.” I have done it a few times in the past with very strict rules. This time – I have allowed a few cheats but I am still saving a ton of money. 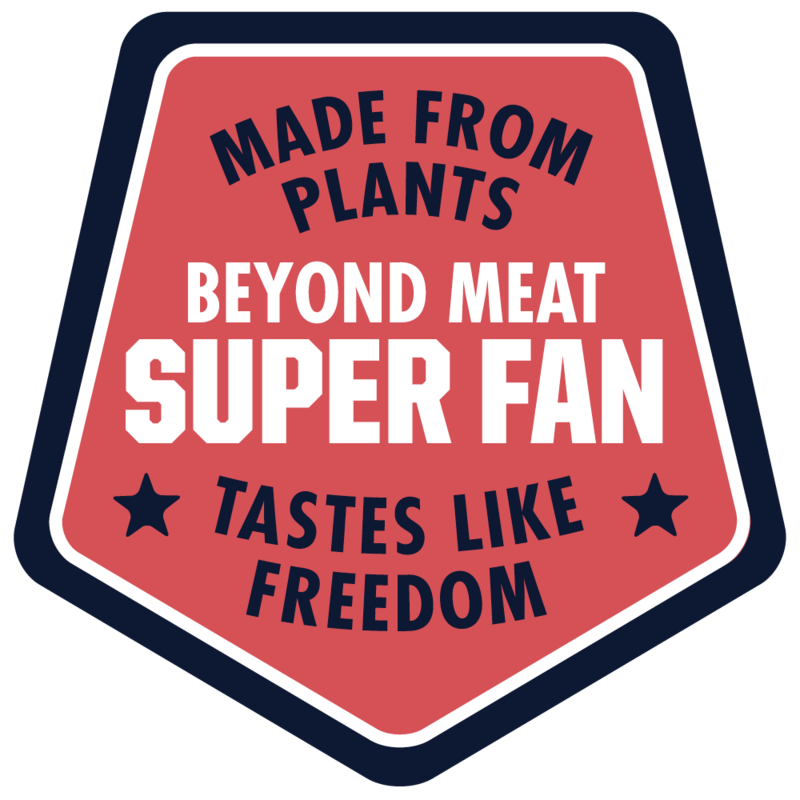 I have so many leftovers frozen away & so many canned & dry goods – I could literally last months. 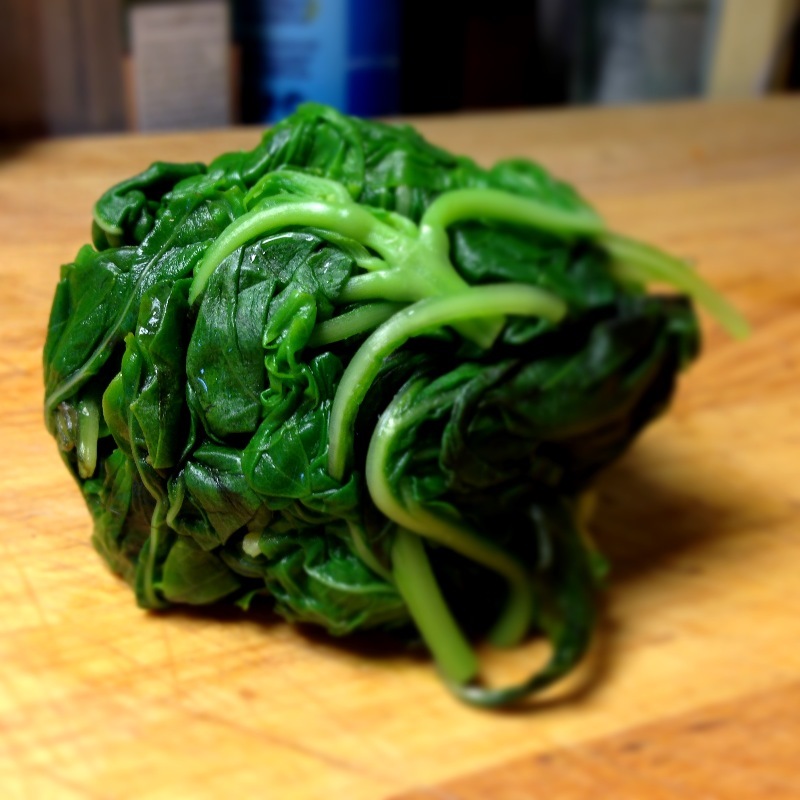 The only problem is that produce gets scarce – so – I have allowed a twice-monthly delivery from Farm Fresh to You. Anyway – I a rambling. 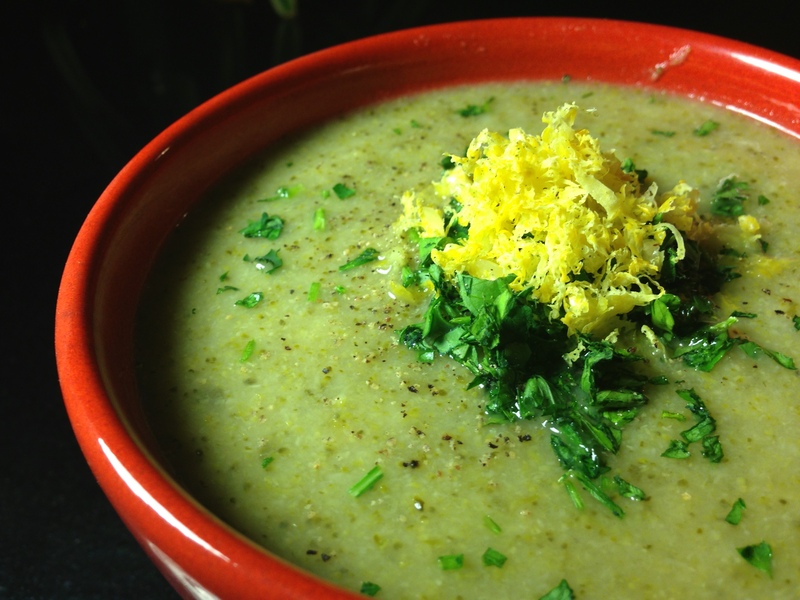 This soup is easy & customizable. You could sub out or lose a few of the veggie ingredients to suit your fancy. 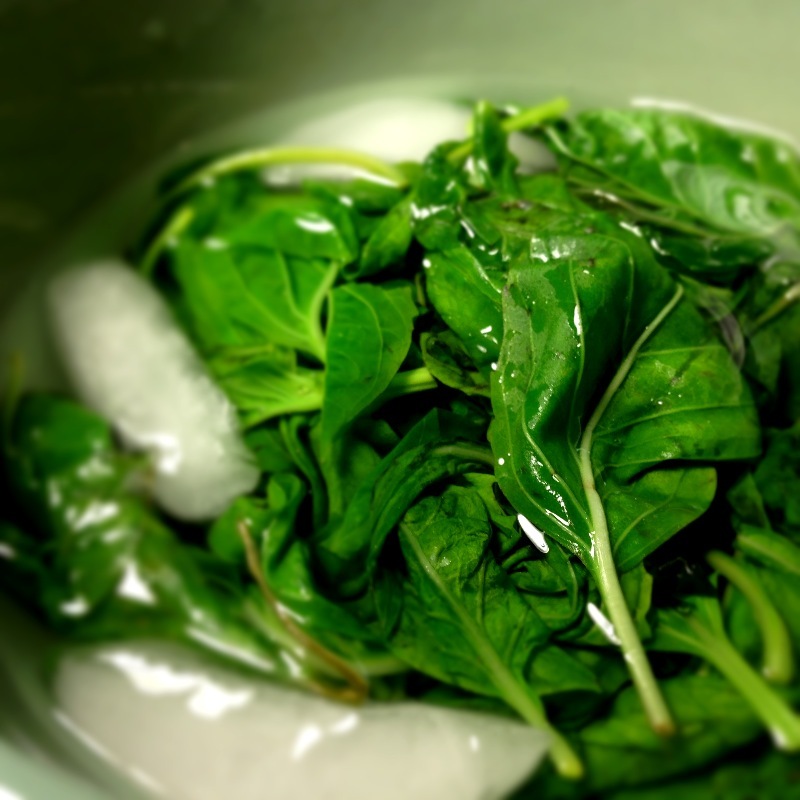 For the sandwich – I used my homemade Vegan Basil Mozzarella Cheese for Grating & Melting – seen below. You can use any cheese you prefer. 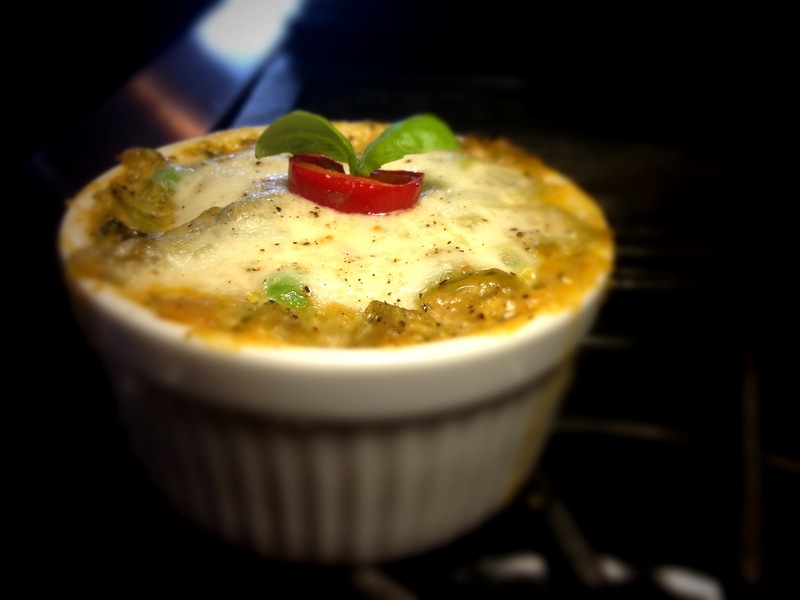 I also topped it with some hot green chiles of the ilk seen above. You can use whatever level of heat suits you. Treat a pan with cooking spray or melted butter. Butter one side of each slice of bread & spray with cooking spray. 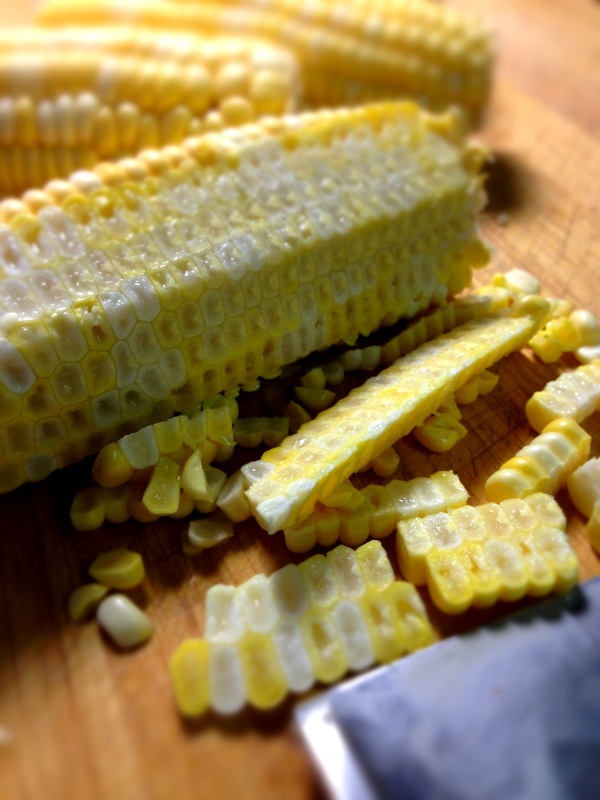 Over medium heat, place the UNBUTTERED side of each slice down for a few seconds to warm them. Then flip one slice, top with cheese & chiles & the other slice of bread – buttered side up. Grill, flipping a few times & pressing with a spatula until the cheese gets soft and/or the bread id grilled to your taste. Heat the oil in a large stock pot. 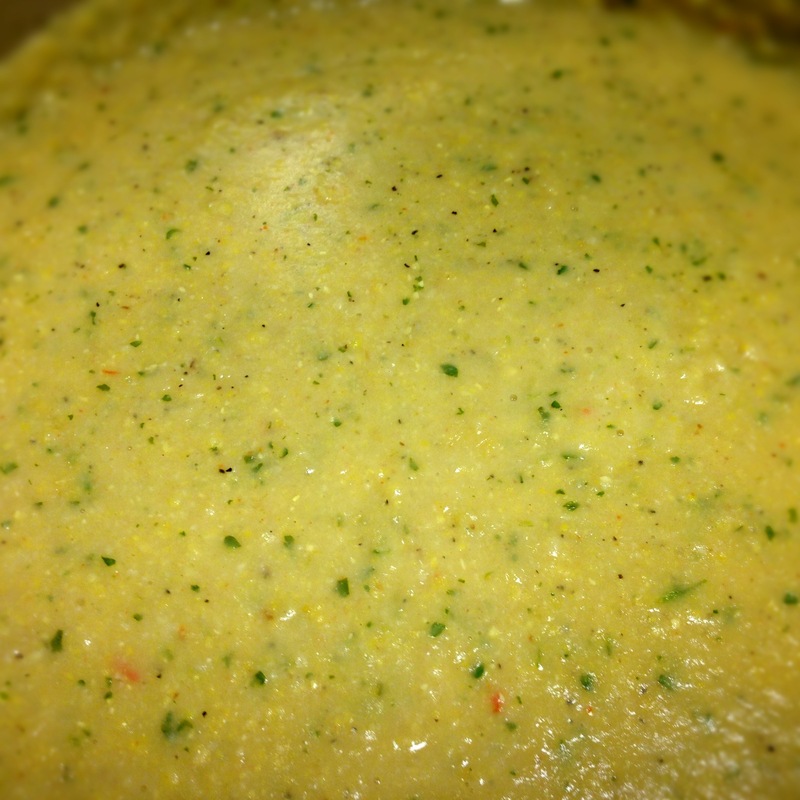 Add the veggies (carrots, leek, bell pepper, jalapeno) & saute a few minutes – until the leek (or onion) is soft. Add tomato sauce & garlic. Bring to a boil. When the carrots & other vegetables are soft, add the cream cheese, milk & basil. Combine. 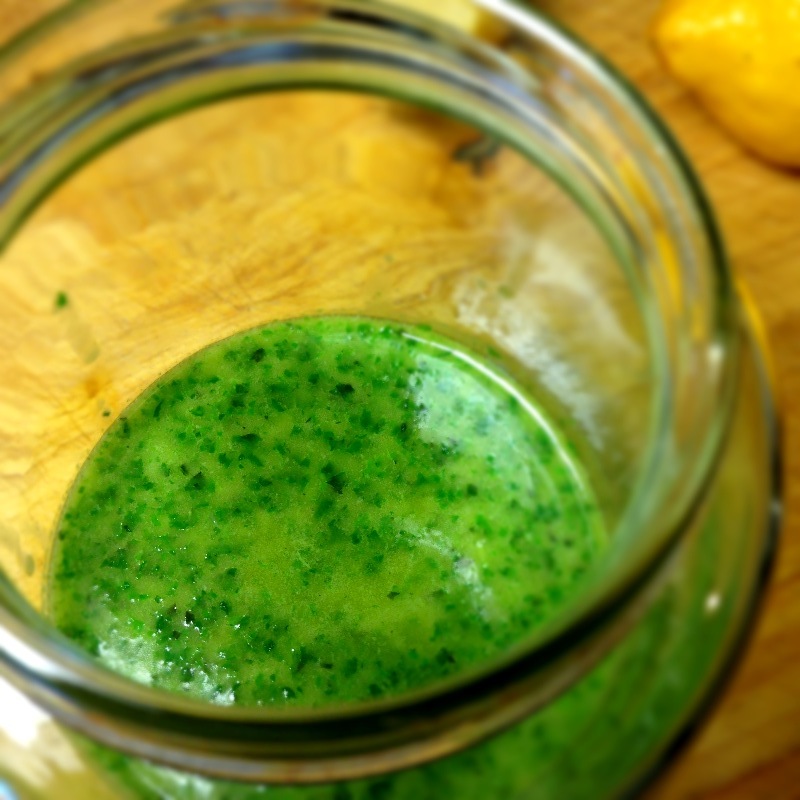 Now – in batches – blend with an immersion blender or a regular blender. Season with salt & pepper. 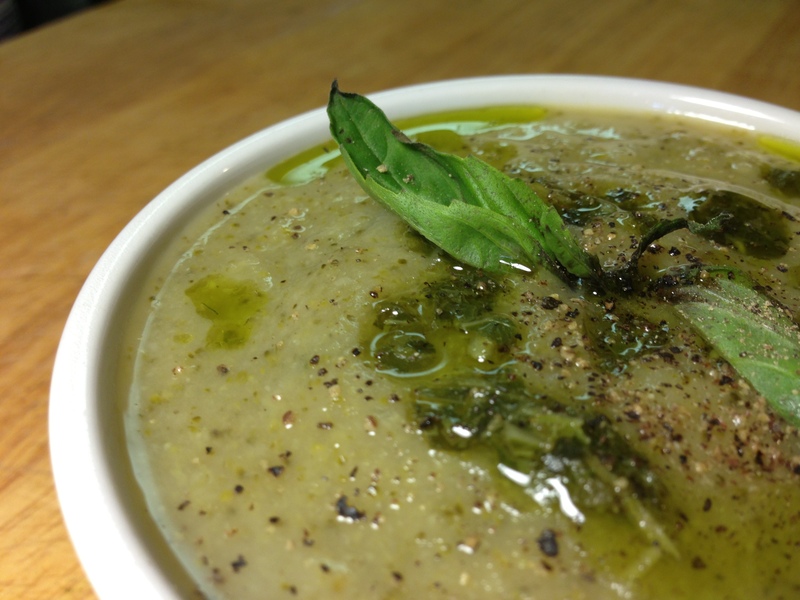 Serve with fresh cracked pepper & basil leaves. Swirl in some cream or sour cream, if you desire. 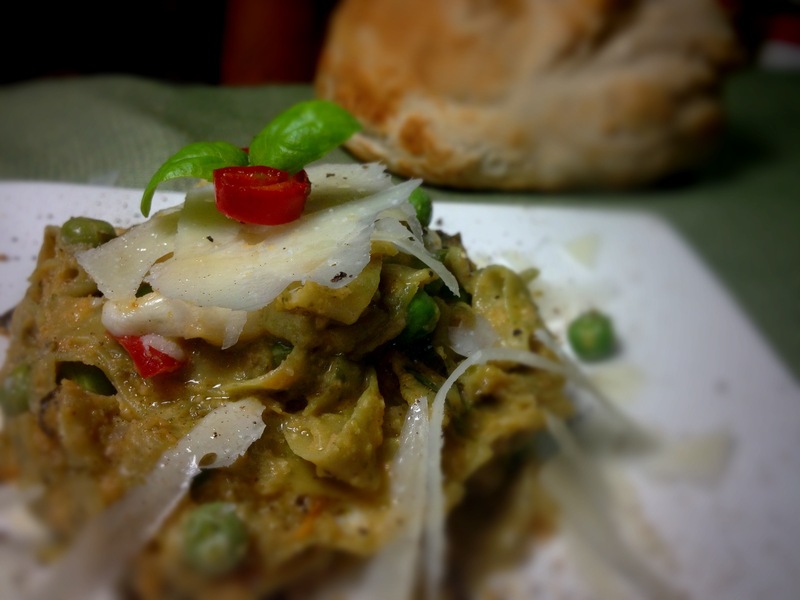 As promised, another recipe made up from several other recipes posted this week. This one uses leftover fettuccine from my Cilantro-Serrano Pasta post and leftover Tomato Bisque and some of my Homemade American Cheese. You can use freshly cooked pasta or leftover, if you have it. 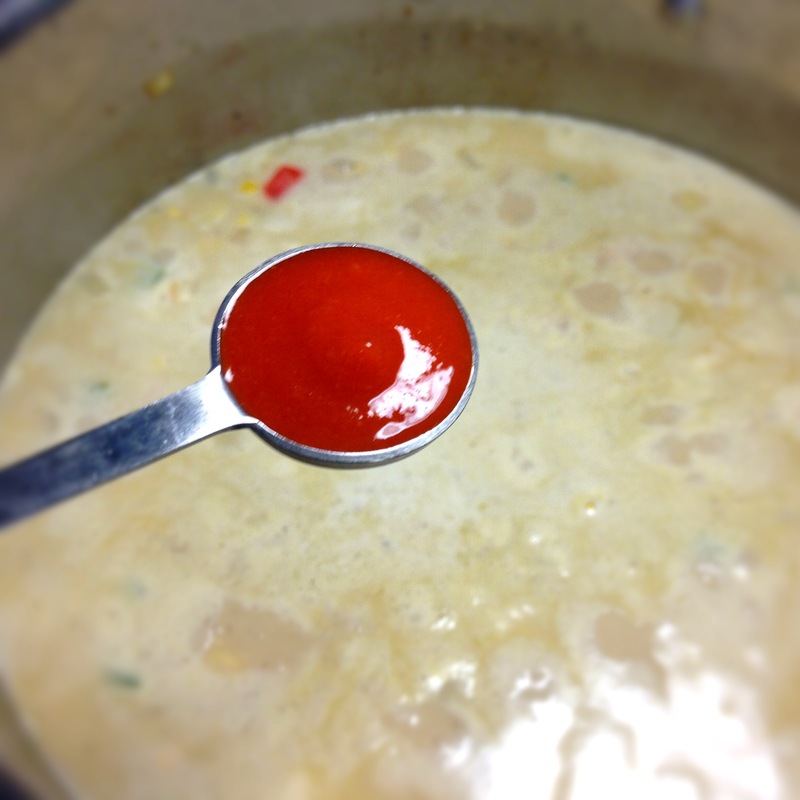 The soup can be replaced with ANY pasta sauce you prefer from a simple arrabiata to a marinara to an alfredo. 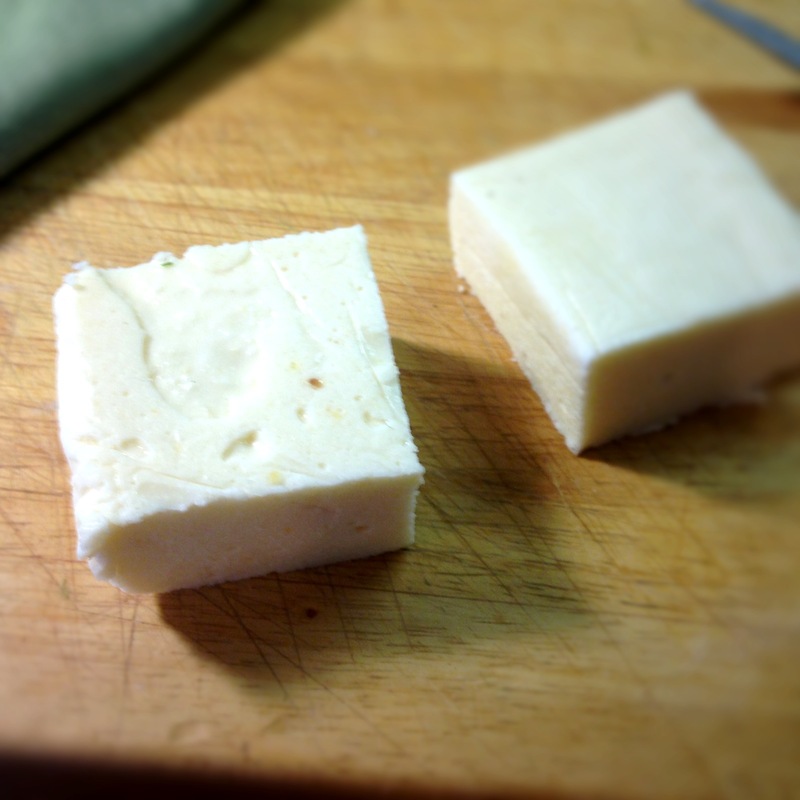 The cheese can also be substituted with goat or Parmesan or whatever you have handy. 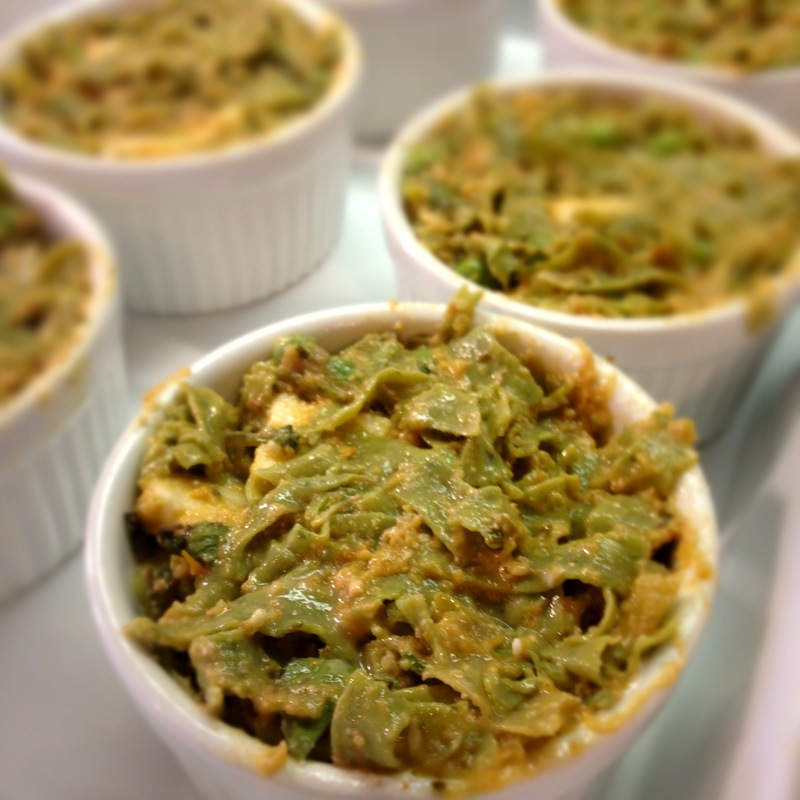 I used English peas because I had them & I love them. This particular effort isn’t that pretty because green noodles & a pink sauce make for an odd combination but let me tell you – it is friggin’ DELICIOUS. I made it & just meant to taste one & stood there & inhaled an entire serving. Really, really good! I had intended to make little wonton baskets for each of these but forgot to – so a version using wontons is likely in my future. At any rate – if you use a white pasta & a red sauce – or some other more compatible color combination – your effort should come out prettier. 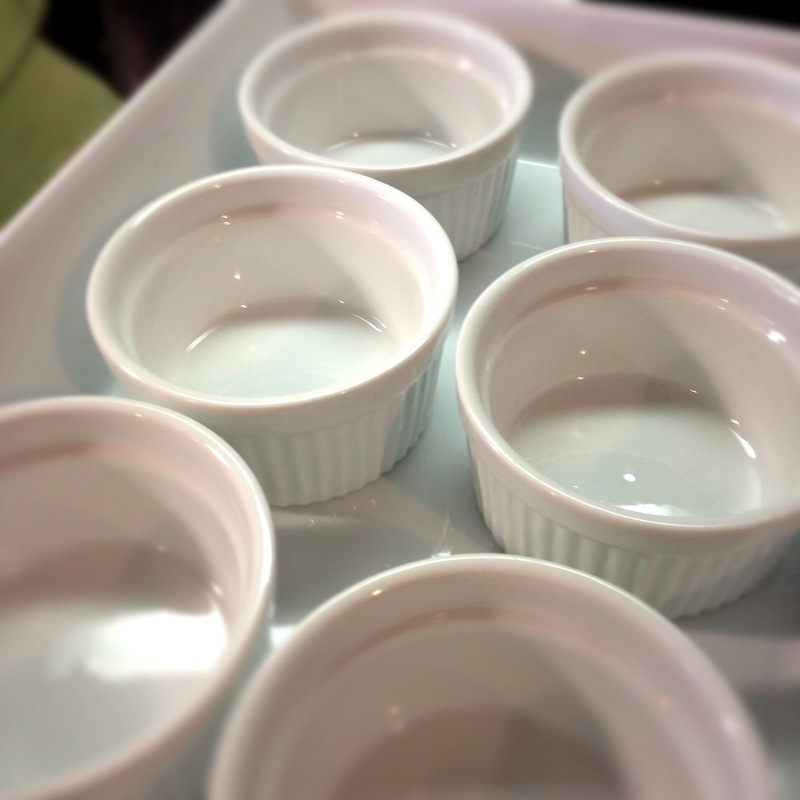 I cooked 6 of these ramekins in a larger pan with water that came up about half way on the ramekins – and one just out there on its own in the oven. In the future – I will blow off the whole water business because it achieved nothing that I could appreciate except maybe slowing the heating process a tad – and there is no practical purpose for that in this recipe. So – you will see images of the larger pan & water but I am not recommending you do it that way. The only thing it adds is a VERY real danger that you will scald yourself with the hot water as you remove these from the oven. 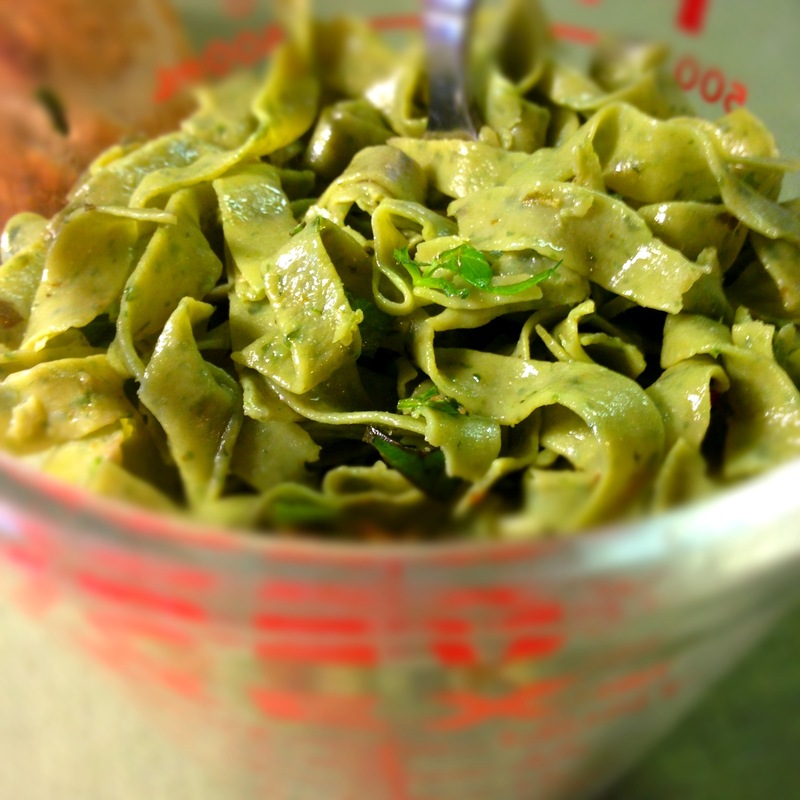 Blend the pasta, sauce and whatever cheese(s) you are using (NOT the mozzarella) in a bowl. 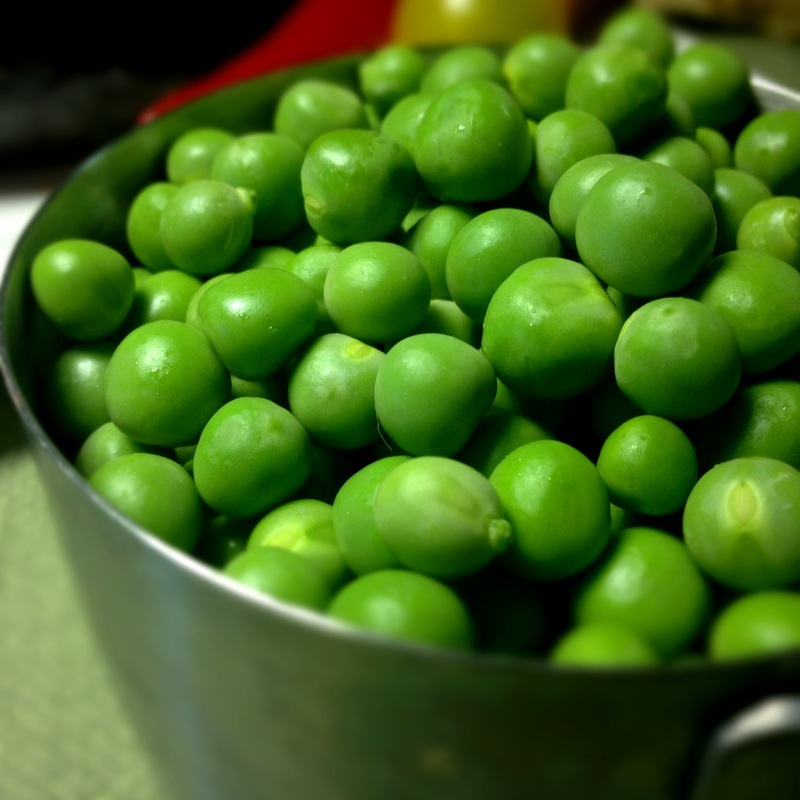 Add the peas – if using. Spray 7 ramekins (sorry – it just worked out to 7) with cooking spray. Divide the pasta mix among them. Try not to over-fill them or they will get messy in the oven. Top with a little extra bisque/sauce & put a slice of fresh mozzarella on each. Grind some pepper on them. Place on a cookie sheet & cover each with a sheet of foil that has been greased with cooking spray. Bake at 350 for 20 minutes. Remove foil & bake another ten minutes. Remove from the oven & let cool a minute or two. 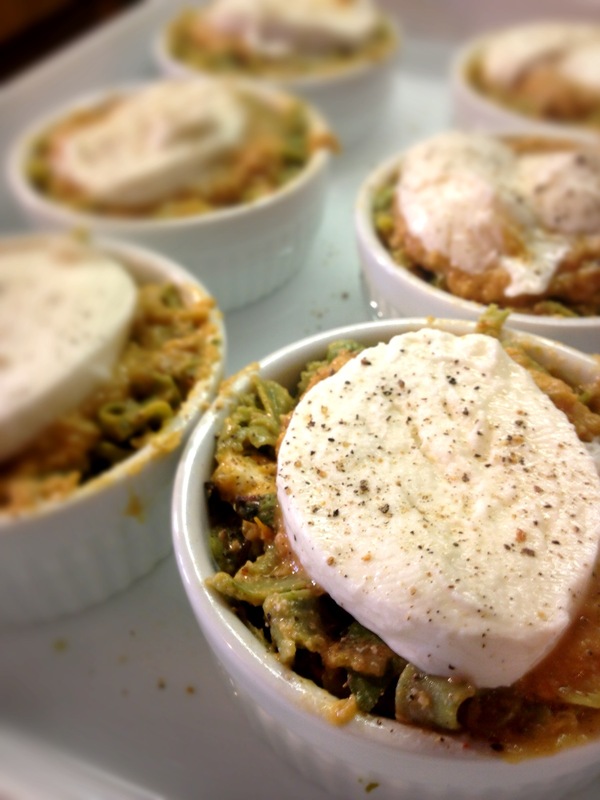 These can be served in the ramekins or flipped over & served on a plate. 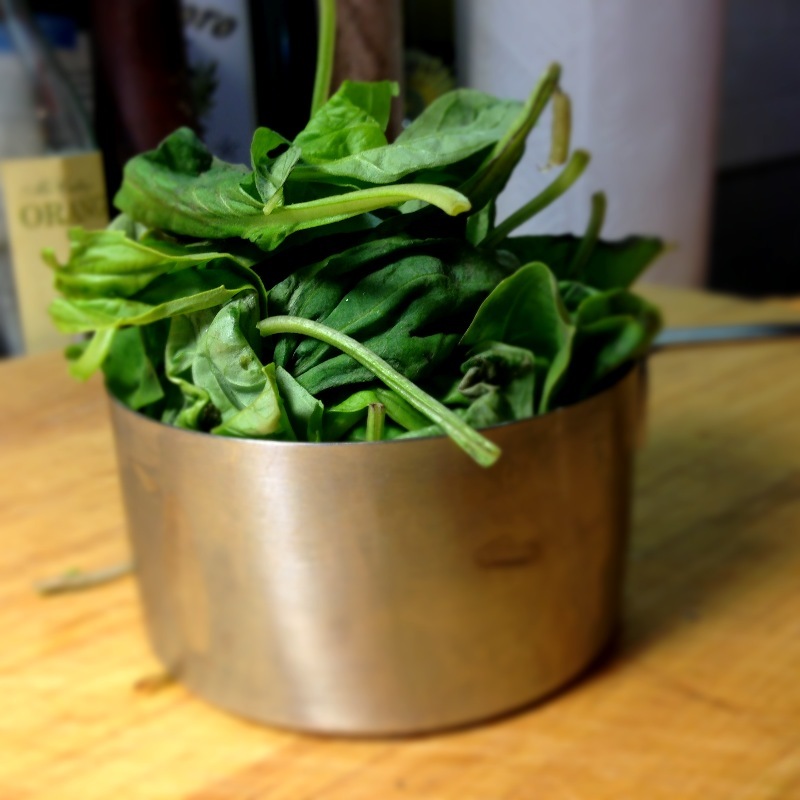 Either way, garnish each with chopped tomato and/r fresh chopped basil and/or some freshly shaved Parmesan. 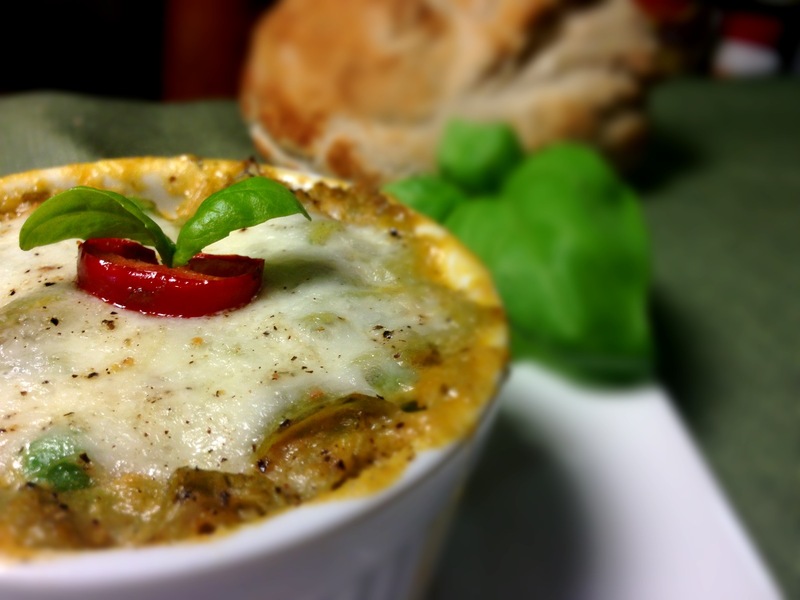 Devour & be proud of yourself for using up your leftovers! Maybe even serve with some leftover Artisan bread!!! Ok, kiddies. 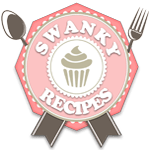 I am going to post two different dishes today that are made from leftovers of the recipes I posted last week. 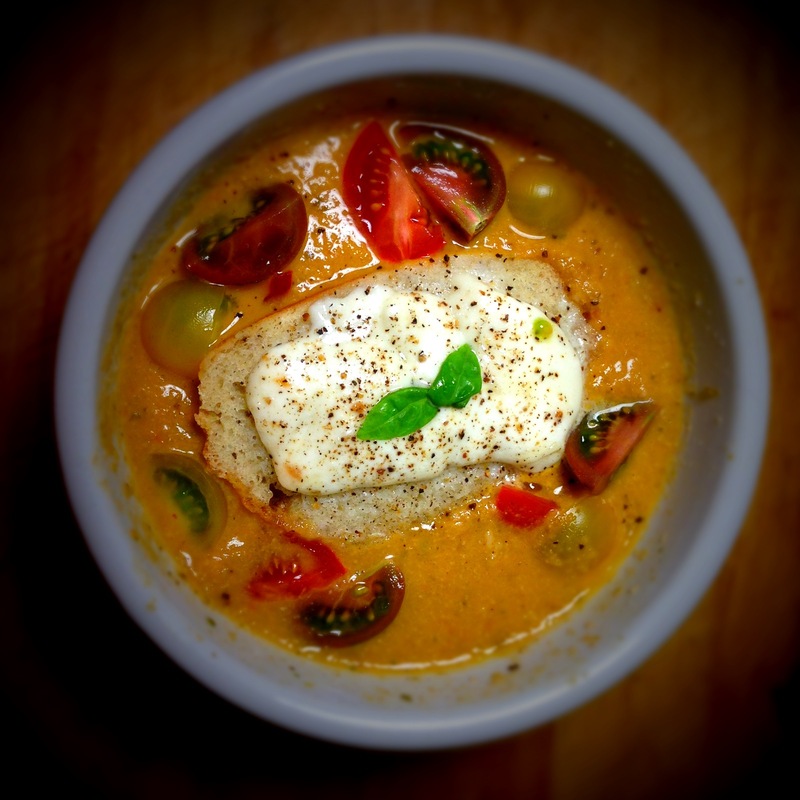 This one uses the Roasted Heirloom Tomato Bisque and the Crazy Super Easy & Quick Artisan Bread. Simply, brush some olive oil on a slice of Artisan bread & toast it in your oven (at about 350 – 400 degrees) for about ten minutes. 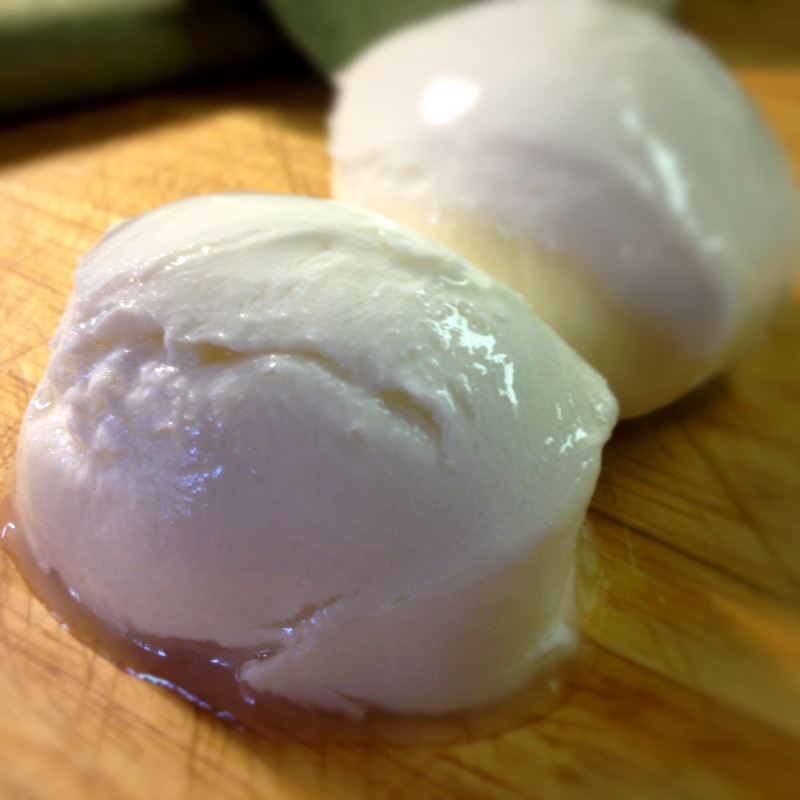 Add a few slices of fresh mozzarella & return it to the oven for a few minutes or until the cheese is melted. 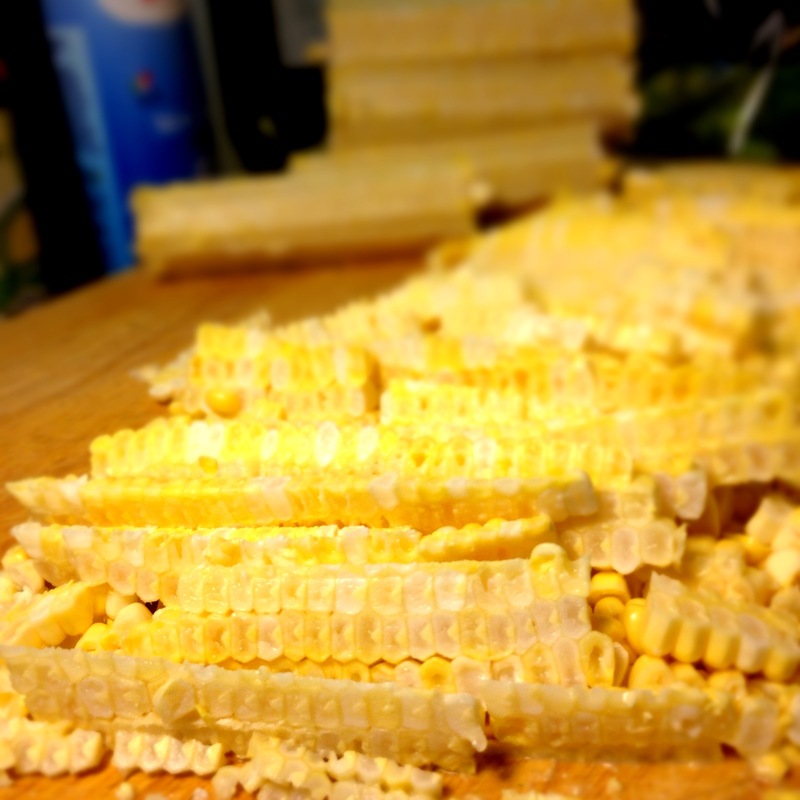 Plunk this bad boy into the center of a warmed bowl of tomato bisque. Garnish with leftover basil oil (I forgot to!!) and some fresh tomato (I used some Heirloom cherry tomatoes), fresh basil & fresh cracked pepper! Ymmmmm! 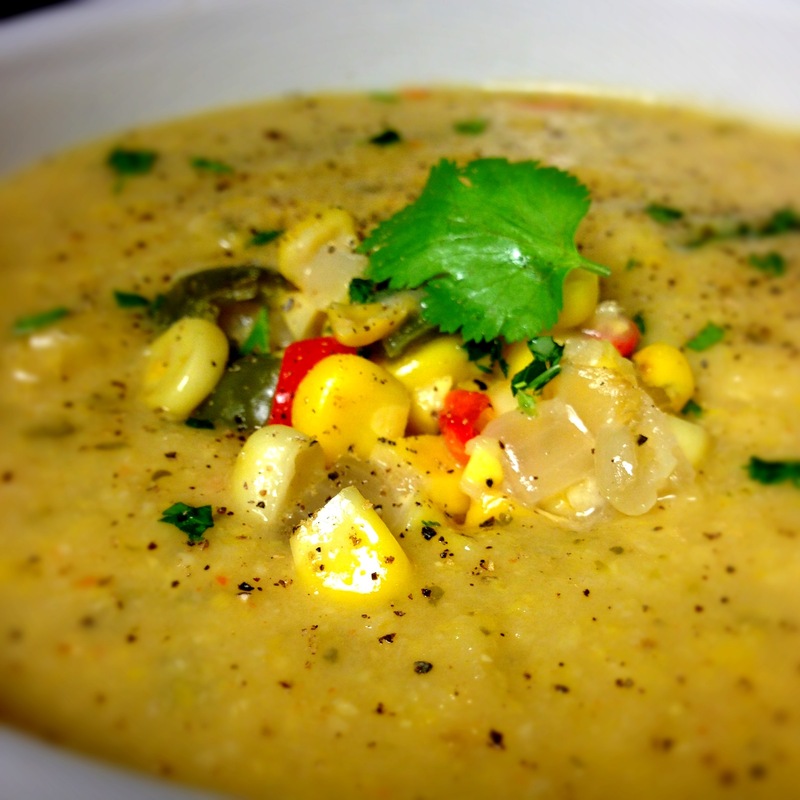 This soup is spicy & tastes rich & creamy despite its total lack of dairy. It gets the rich creamy element from soaked & pureed cashews. Ymmm! There are a few steps required but all are simple. Do not be intimidated. 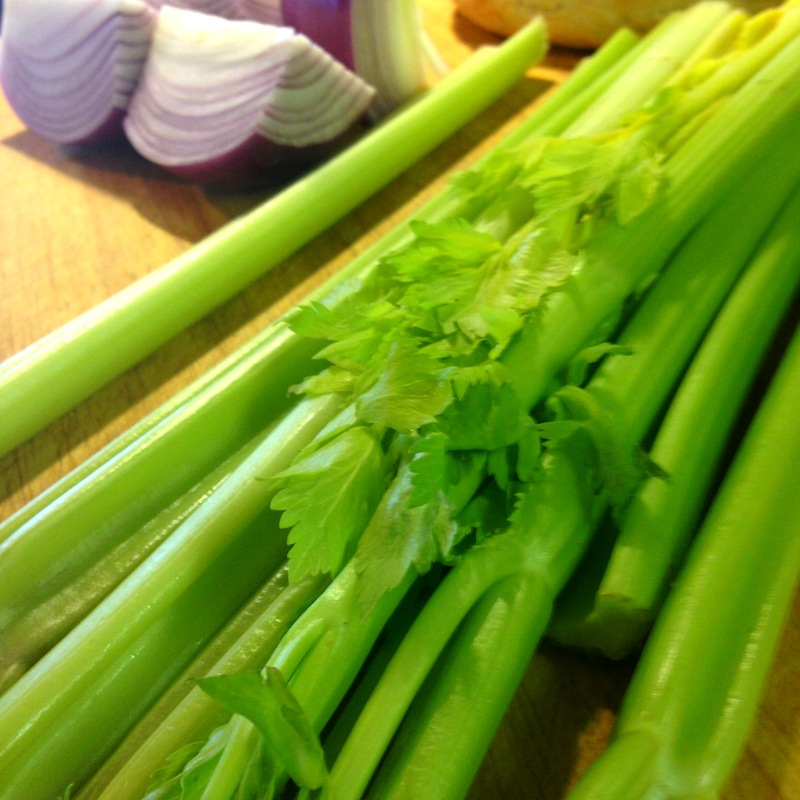 I used lots of celery because I had it & it needed to be used. I also used heirloom cherry tomatoes – for the same reason as the celery – but larger tomatoes are more desirable. 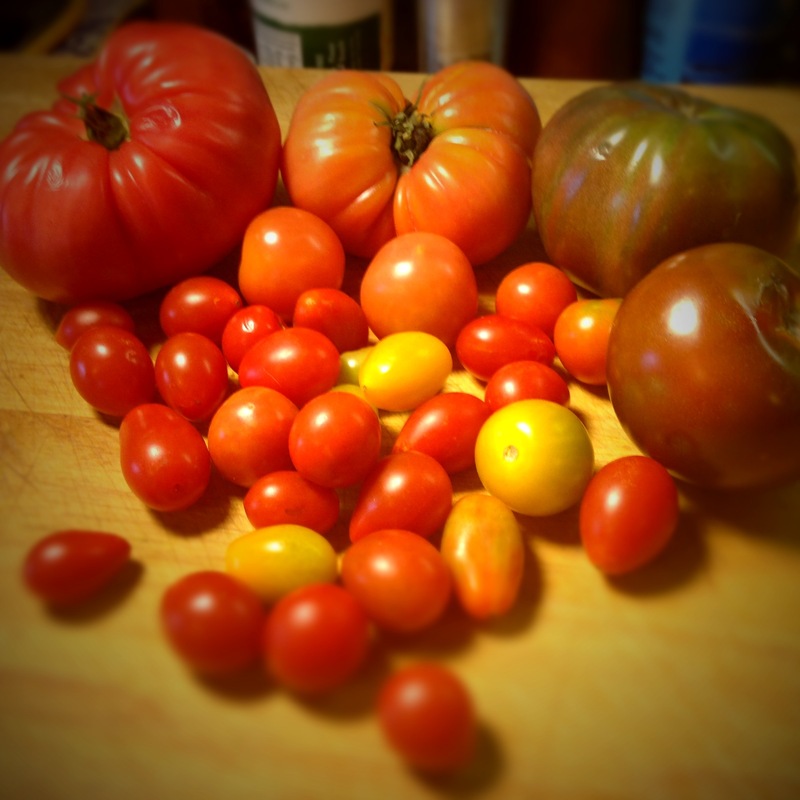 You can use heirloom or Roma or any variety of tomato. My soup came out less red than your average tomato soup because not all my tomatoes were red & because I did not use tomato paste. 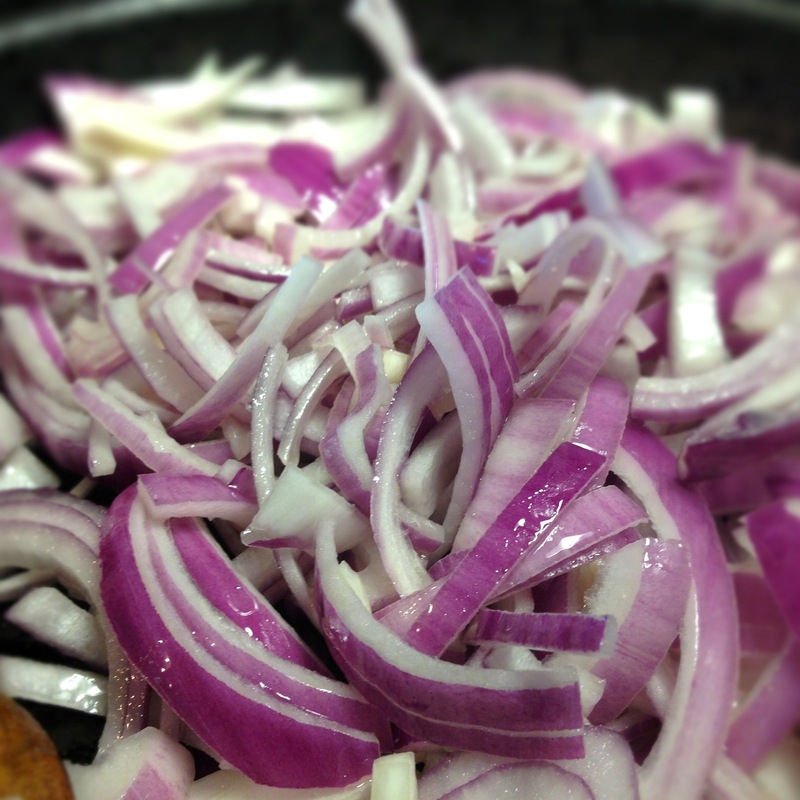 Also – I used a red onion because that was what I had. Yellow or brown might be better. 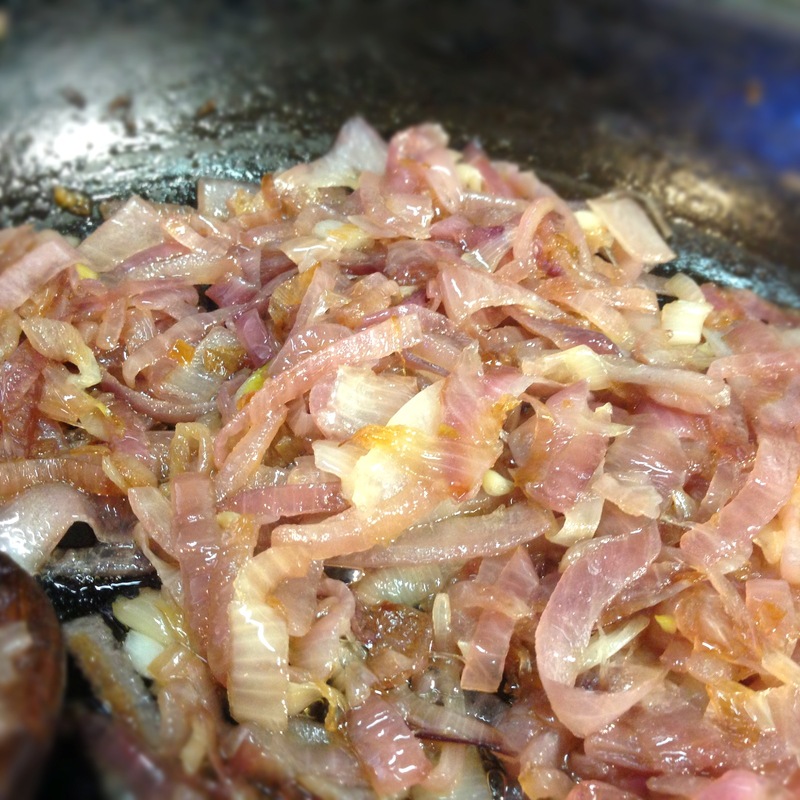 Also – since spending 90 minutes caramelizing an onion might be too labor intensive for you & make you blow off this recipe entirely – know that the caramelized onion ingredient can be omitted without a huge loss in flavor. 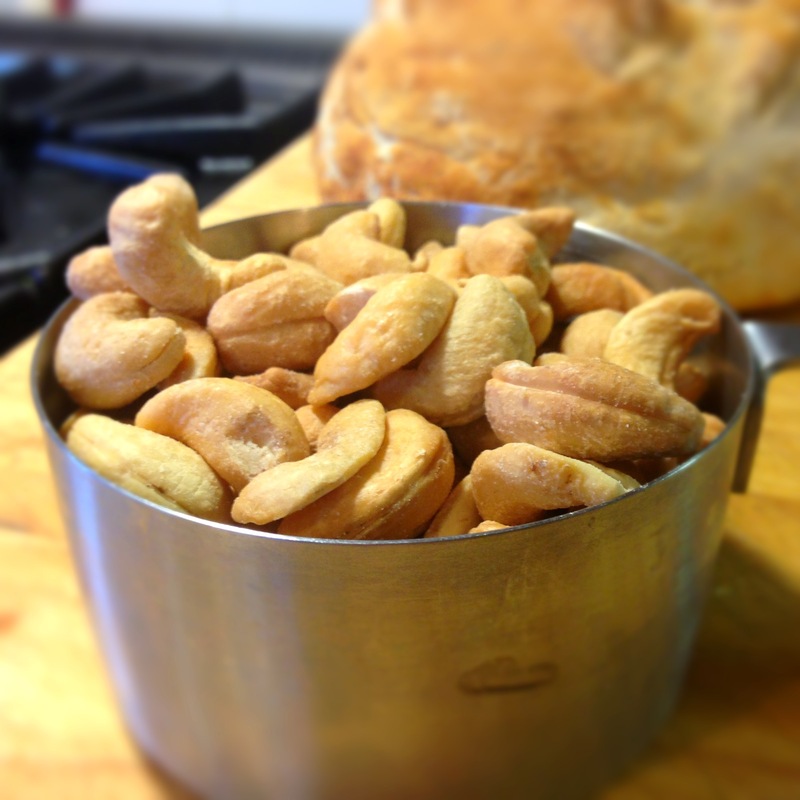 Also – cashews can be soaked overnight rather than boiled & soaked for an hour. 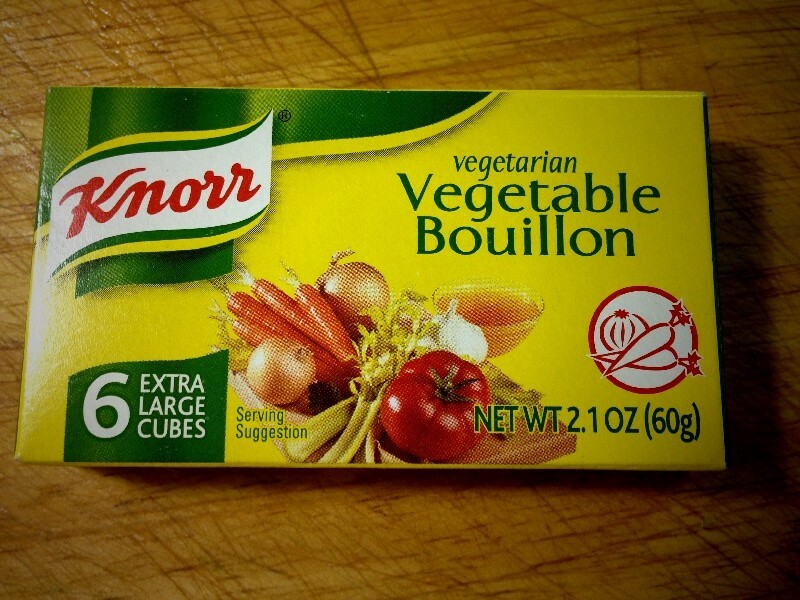 Also – this soup need not be vegan. Heavy cream added at the end is a nice touch if that appeals to you – and would make the cashews unnecessary. 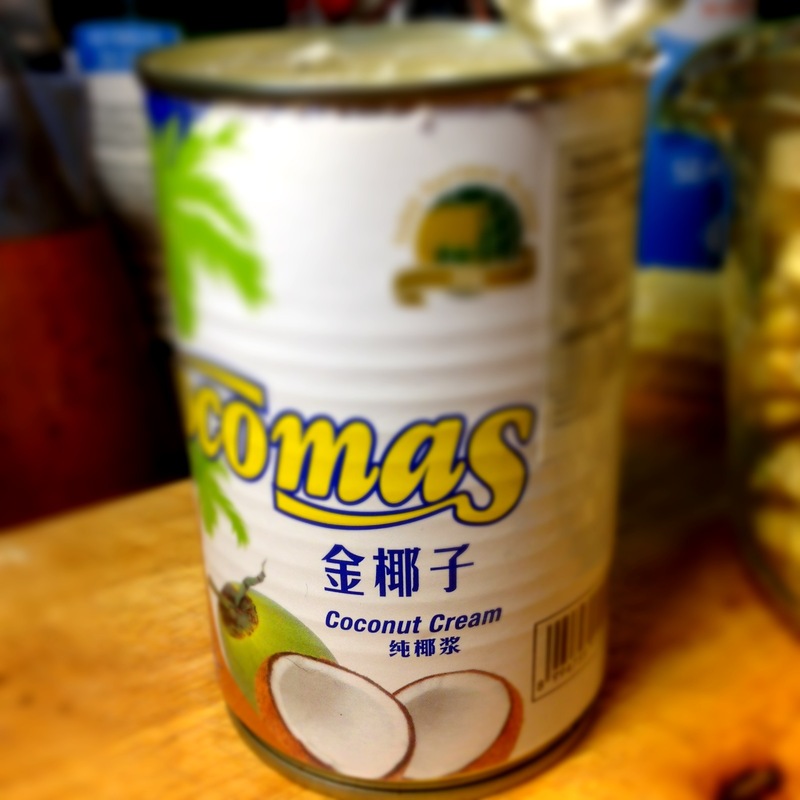 I recommend trying the cashew version at least once, though. It is a healthier option. GARNISH OPTIONS – more fresh basil, balsamic vinegar, grated cheese, blue cheese or goat or feta (crumbled on top), fried sage leaves, shaved Parmesan, homemade basil oil, sour cream, creme fraiche, heavy cream, croutons – whatever you like. And LOTS of fresh cracked pepper! In a small pan, cover the cashews with water & bring to a boil. 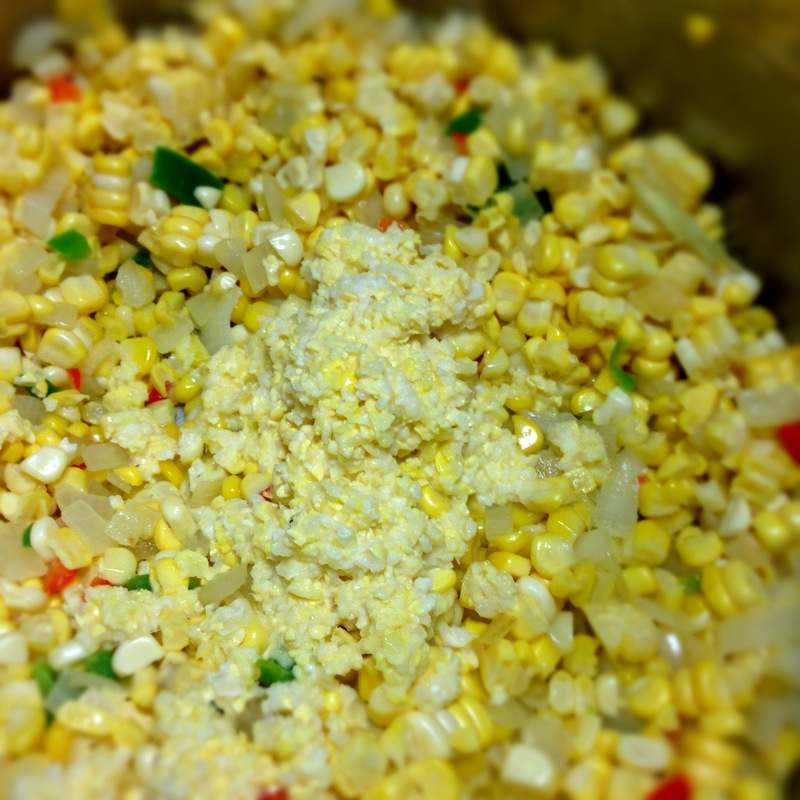 Remove from heat & allow to soak one hour. 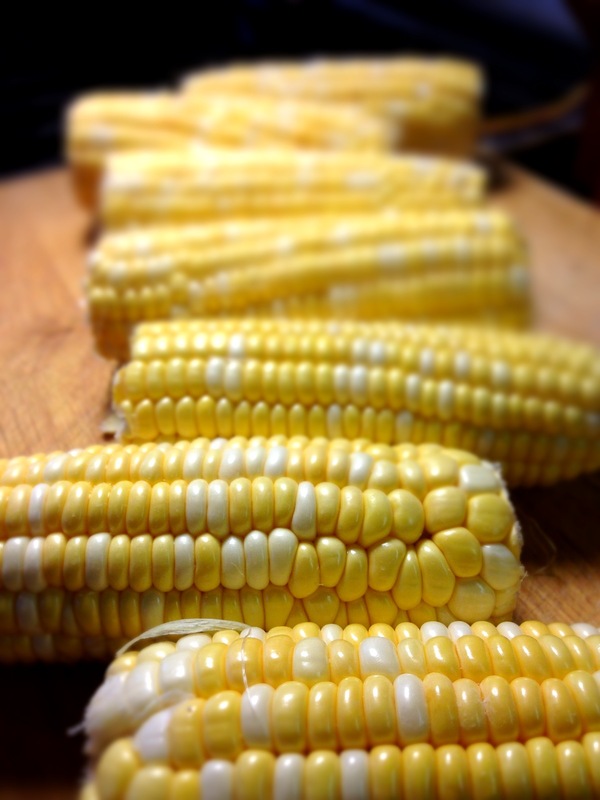 Or, conversely – let them soak overnight. 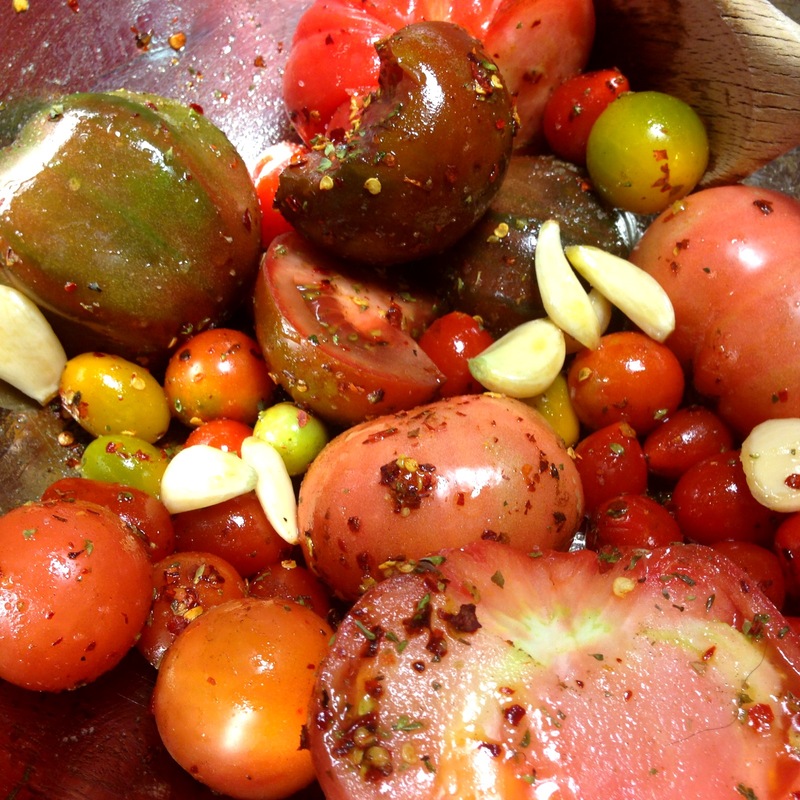 Cut your tomatoes in half (or if using some cherry tomatoes, as I did, leave them whole) & toss all the tomatoes & FIVE of your garlic cloves & serrano or jalapeno peppers with 4 TBS olive oil, crushed red pepper, thyme, oregano & a sprinkling of salt. Place tomatoes cut side down on a greased (with cooking spray) or parchment paper lined cooking sheet & roast in the 350 degree oven for about one hour. Meanwhile, saute the onions in 1/4 cup olive oil on low to medium-low heat, stirring often, for about 90 minutes. This will release their sugar & caramelize them nicely. Once they are caramelized, add tomato paste (if using) & saute for a few more minutes – stirring to blend with the onions. Set aside. Once the cashews have soaked for an hour, puree them in a blender or food processor with the water until perfectly smooth. Set aside. 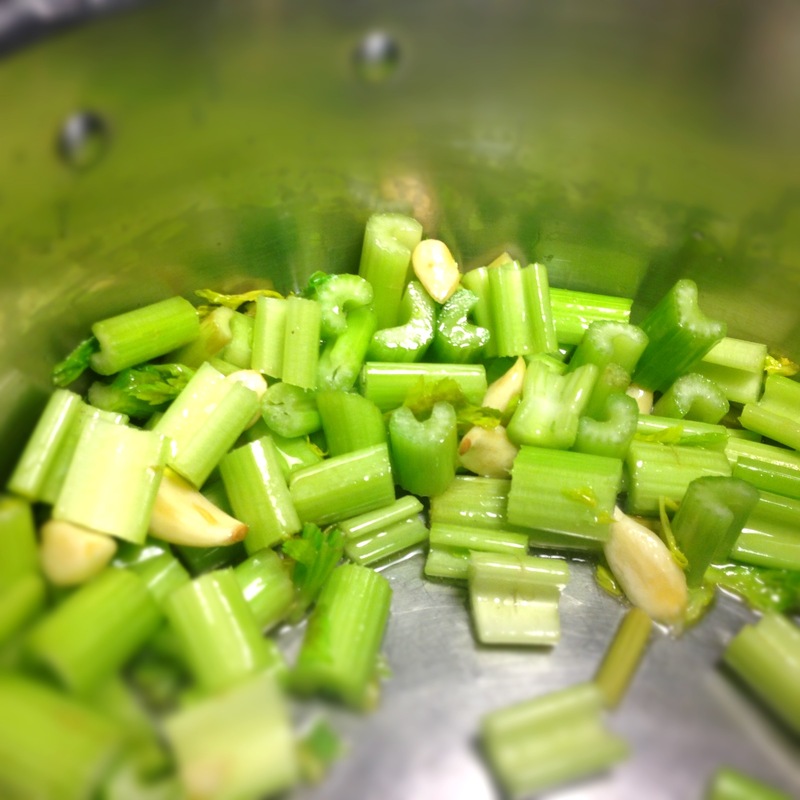 If using celery, saute the celery in 2 TBS in a large stock pot in olive oil for 5 minutes or until it becomes tender. 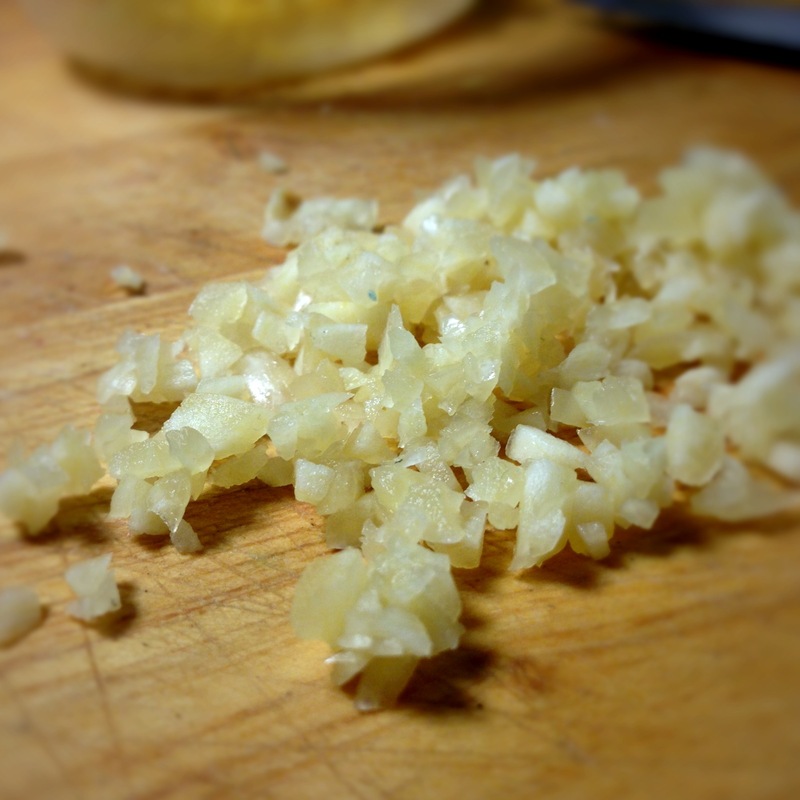 Add the 5 remaining garlic cloves & continue cooking another 2-3 minutes. 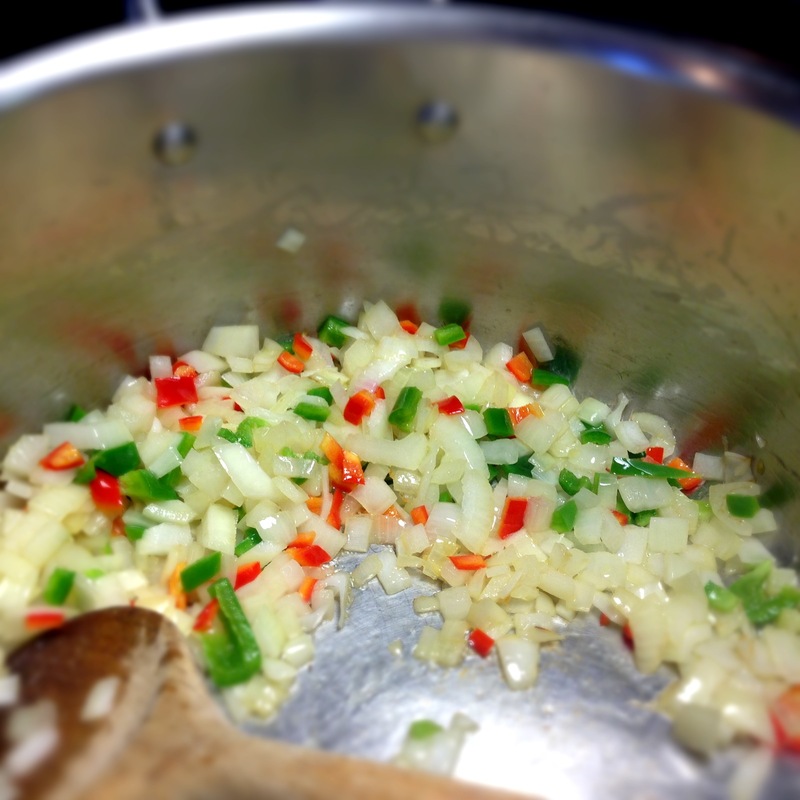 Or – if not using celery – start just by sauteing the 5 cloves or garlic for a minute or two & carry on as follows. Add the caramelized onion & tomato paste mixture. Add the cashew puree. Stir. 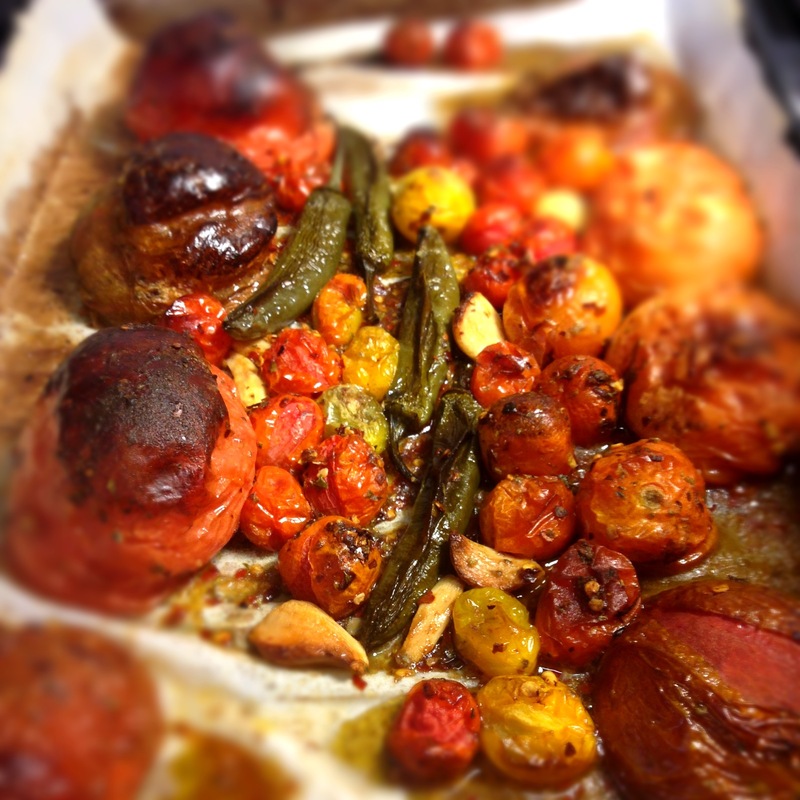 When the tomatoes are done roasting, see if any of the charred skins can be easily plucked off. Be careful not to burn yourself. Pluck off the skins that come away easily & discard. If the skin resists, leave it be. 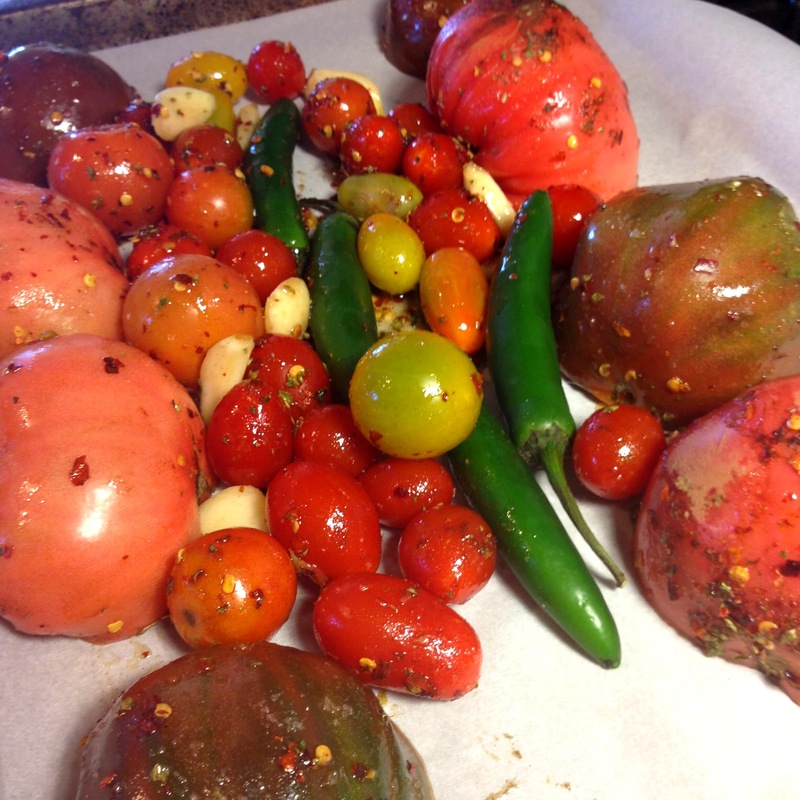 Cut the stems off your serrano/jalapenos & then add all the roasted items and any juices to the stock pot. Stir to combine. 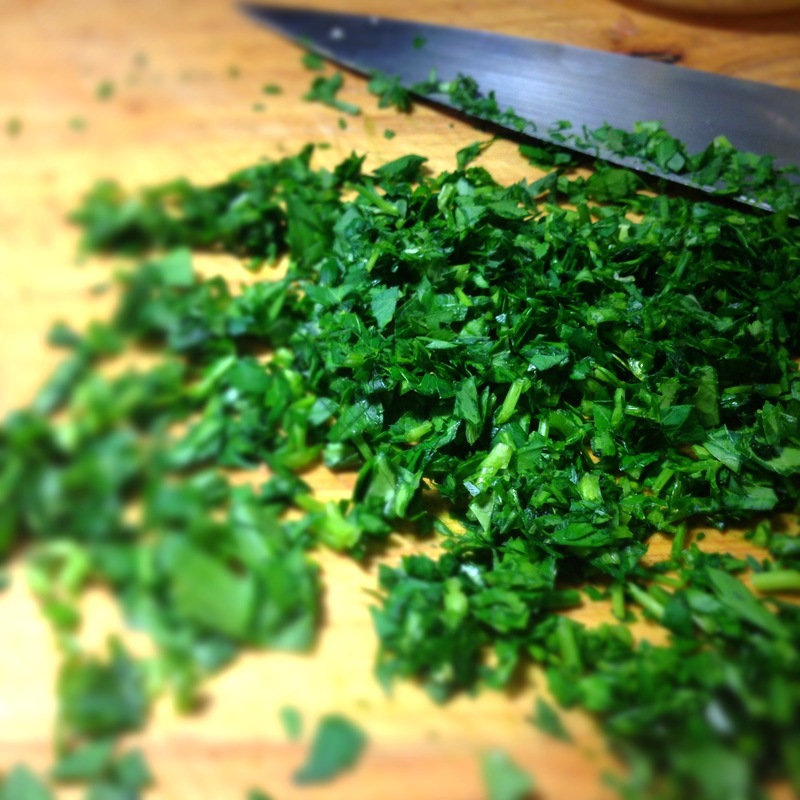 Add the chopped basil and the bouillon cube (if using). At this point, you may or may not want to add some water. This is a judgement call based purely on how thick or thin you like your bisque. I went VERY thick & did not add much water at all – less than a cup in total. 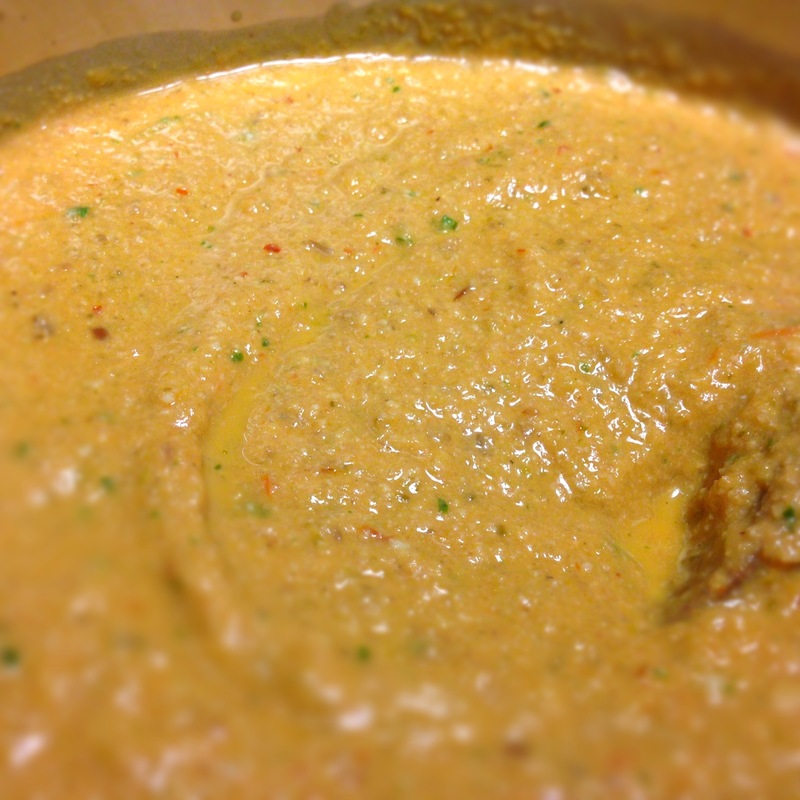 I used & immersion blender & pureed everything in the stock pot. 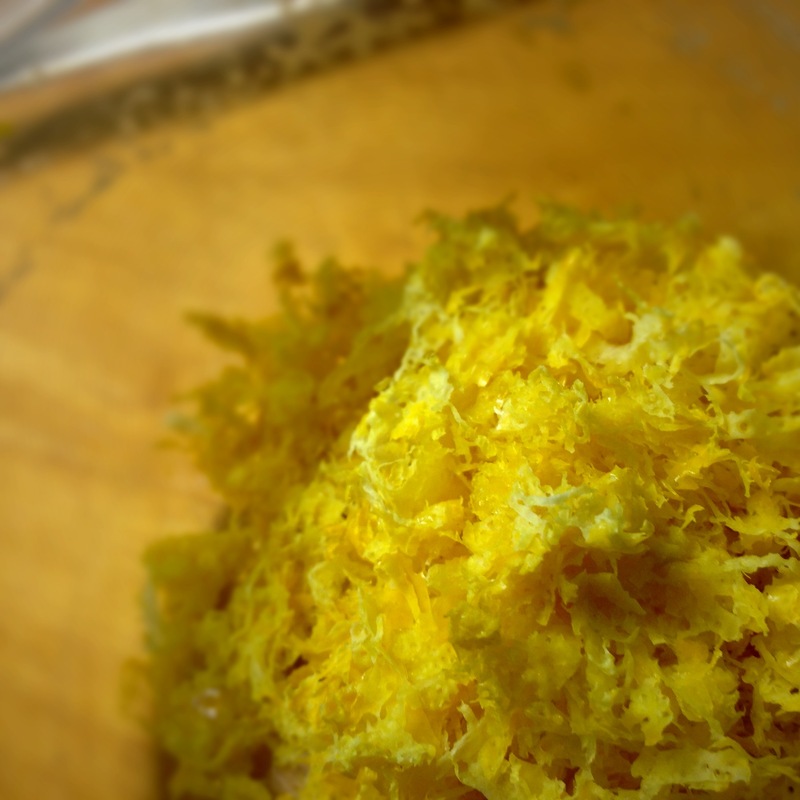 You can do this or blend it in batches in a blender or food processor. 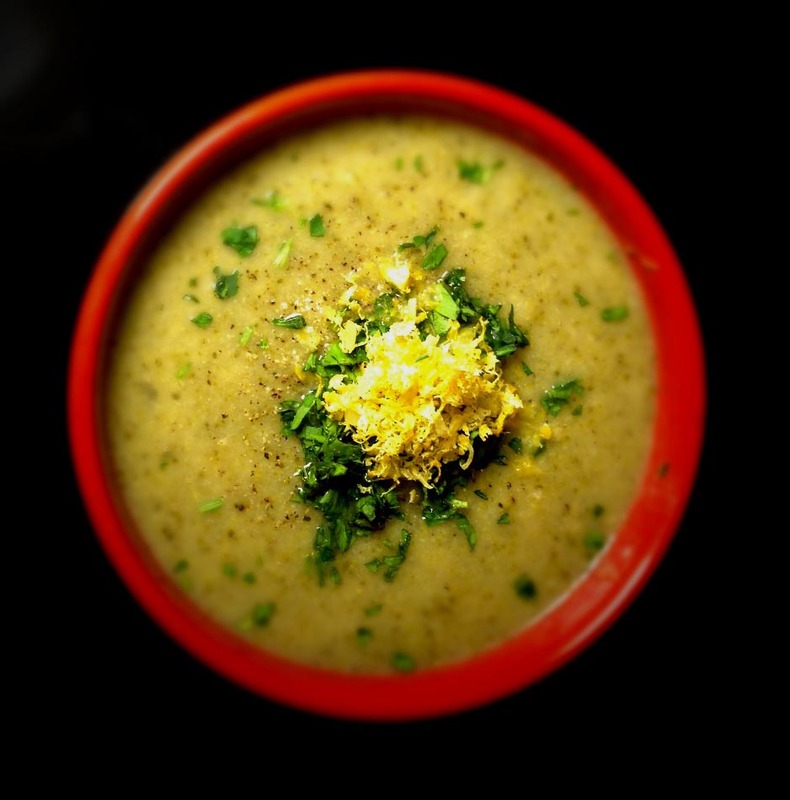 Whether or not you add much water, once the soup is blended, taste it & add salt & pepper to taste. If you want a really creamy bisque, adding a half pint of heavy cream would achieve this nicely. 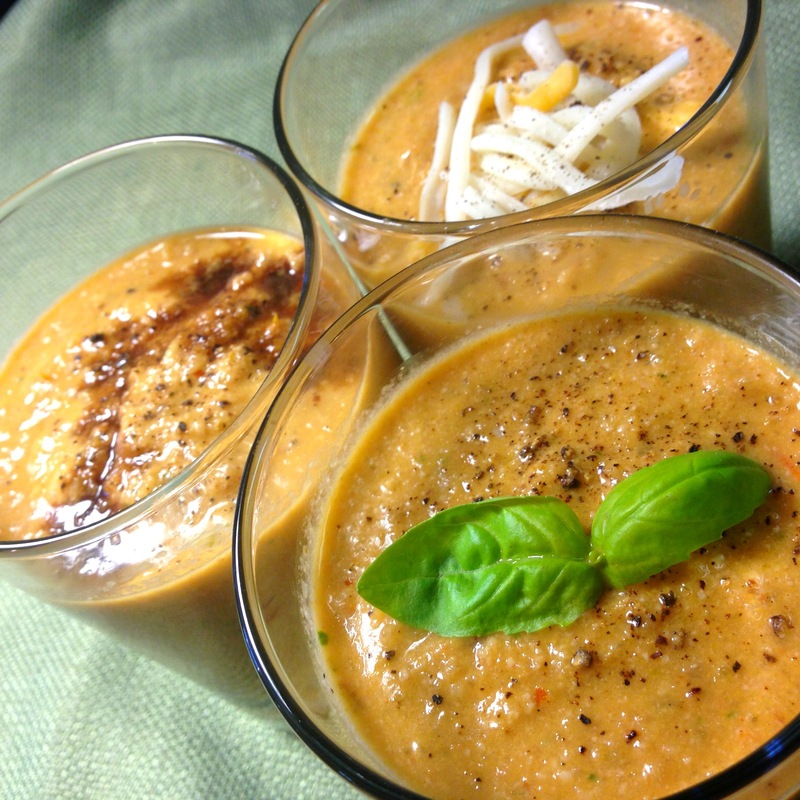 Tomato Bisque three ways: with balsamic vinegar and with grated cheese & with fresh basil.